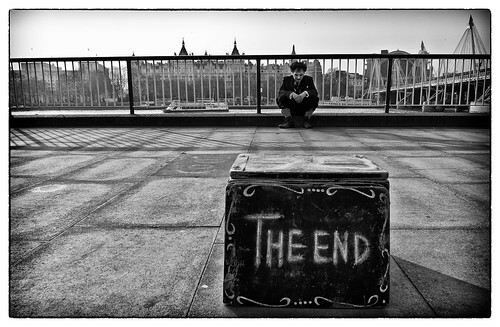 The end, a photo by Alexandre Moreau | Photography on Flickr. The other night I found myself lamenting that it had been so long since I’d worked on my book. Moments later, when I was calculating just how long it had been, I realized that the date was December 1st, meaning it had only been one day since NaNoWriMo ended and I declared myself a winner. Writing is no longer in my heart. It’s in my blood. A necessity approaching eating and sleeping. I thought when I posted The Doldrums that I was just days away from a month long vacation from writing. A well needed reprieve. But simply the act of putting my feelings and frustrations into words and posting it on this blog revived me and I found myself wanting to write even more. NaNoWriMo enabled me to write the ever elusive words “THE END” on my first novel but it also taught me a few other things about myself and writing along the way. 1. Goals need a finish line: I’ve never been fond of goals. I am an all or nothing kind of person. If I want to do something, I am determined to do it. If I don’t want to do something, even if it’s a worthy goal, I don’t even try. But NaNoWriMo opened up my eyes to the value of well-defined goals. You may not be exactly where you want to be when you finish, but you’re closer than not starting at all. I have been working on my novels (I’m already 60,000 words into the second one) for over 4 years. I’d always planned on finishing, someday, but I had never actually envisioned the finish line. In my last week of NaNoWriMo I was forced to do that. I had to sit down and think there has to be an end to this. I’m beginning to wonder if I ever would have gotten there if I wasn’t forced into it. If you’re a writer, set well-defined goals. 2. Blogging and practice make perfect: Starting a blog while trying to write a novel in 30 days is very near insanity. Until I started blogging I didn’t understand that blogging itself can be a very serious form of writing. It’s intense and it takes time. Time that could be spent getting my word count. But, there were two benefits. I was publicly accountable to everyone reading my blog and that accountability motivated me on the bad days. (Failure is not an option, although it should be, see above point.) And, as I’ve mentioned, one of my posts pulled me out of a slump. Writing in any form begets more, and hopefully better, writing. 3. Perfectionists and first drafts don’t dance well together: I am a recovering perfectionist. It is something that I will struggle with my entire life. I began to fight it when I realized perfectionists can never be happy because they will never be perfect. When I started writing years ago I was naive. I wanted to write my manuscript perfectly the first time. When I wrote “THE END” I was absolutely certain that it would be my one and only draft. But, that’s arrogant and limiting. Critique and input from other people doesn’t make your work any less valuable, it just allows you to pull more from yourself. NaNoWriMo lends itself to fast, not necessarily good, writing. It’s about filling the page and ignoring the inner editor. My manuscript is a mess. Plot holes. Weak characters. Ridiculous scenes. My new adventure is tearing that manuscript to shreds and making it even better. 4. Failure is an option and an opportunity: I recently read blog posts by two people, here and here, who participated in NaNoWriMo and didn’t “win.” Neither of them is a “loser.” On the contrary, they are both moving forward with lessons learned, ideas, and novels in the works. I recognize that it is a very distinct possibility that I would have lost NaNoWriMo too, if I hadn’t cheated. Oh, the lessons I could have learned from that! A new well-defined goal will be coming soon, so stay tuned.